What is Tissue Culture: The term tissue culture is commonly used to describe in vitro and aseptic cultivation of any part on a nutrient medium. Tissue Culture Hood: Tissue culture hood is a type of laminar flow cabinet or hood which carefully manufactured in a enclosed bench design that prevents the contamination produced from biological samples, from those materials which are particle sensitive and as well as the semiconductor wafers. The technique tissue culture was first introduced by Haberlandt in 1902. He was first to attempt cultivation of isolated plant cells in vitro on a nutrient medium. However, his attempt failed. White in 1934 first successfully cultured excised tomato root tips in nutritive medium. Later, Gautheret in 1939 and Nobecourt and White in 1939 independently obtained plant tissue cultures in the form of callus cultures from cambial tissues isolated from tobacco and carrot. Then Van Overbeek and his coworkers in 1941 demonstrated highly nutritive property of coconut milk in culture medium in culture of isolated embryos of Datura. White and Braun in 1942 initiated studies on crown gall and tumor formation in plants using tissue culture method. Skoog in 1944 started work organogenesis in tobacco callus. Steward and coworkers obtained a completely regenerated carrot plant from cultured secondary phloem cells from tap root. In the past, if a plant breeder wished to propagate a hybrid plant, a method of vegetative reproduction was used, such as taking stem, leaf or root cuttings. This is a relatively rapid way of reproducing a plant, but not all plants can be reproduced like this. 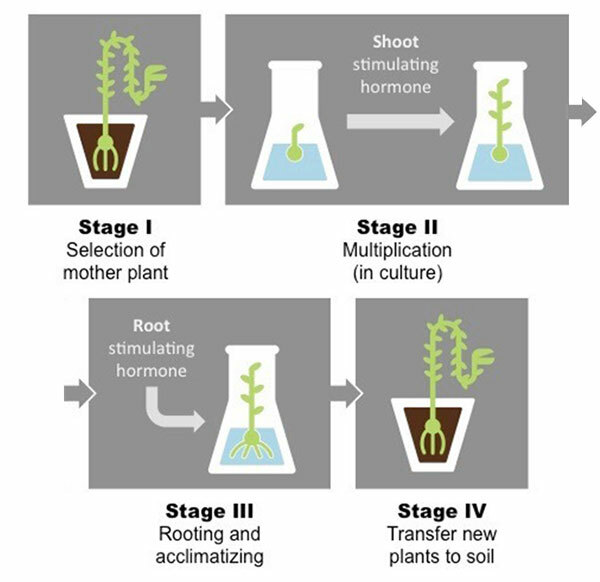 Methods of plant tissue culture gives vegetative reproduction on mass scale. Within a few years several thousand plants, mostly identical to the original plant, can be produced. However, some mutations may occur, giving occasional variant plants. So, the propagation of different plant by plant tissue culture procedure is also used after genetic engineering. 1. The plant part, called explant, must be isolated from the rest of the plant body. 2. The explant must be maintained in a controlled nutrient medium. 3. Asepsis must be maintained. 1. The initial plant tissue culture steps involves the removal of young developing orchid stems called pseudobulbs from the parent plant. The leaves are discarded from the pseudobulb and the stem surface is sterilized with a dilute solution of sodium chlorate (bleach). 2. Then small pieces of tissues excised from the pseudobulbs, called explants, are placed in a sterile liquid medium containing minerals, organic nutrients and plant growth regulators. 3. Undifferentiated cells in the explant, such as the meristematic cells of the cambium, divide by mitosis and produce a mass of undifferentiated tissue called a callus. 4. This callus is transferred to the nutrient medium where it differentiates into tiny plantlets. These grow and when 5-10 cm long are transplanted into sterile soil. 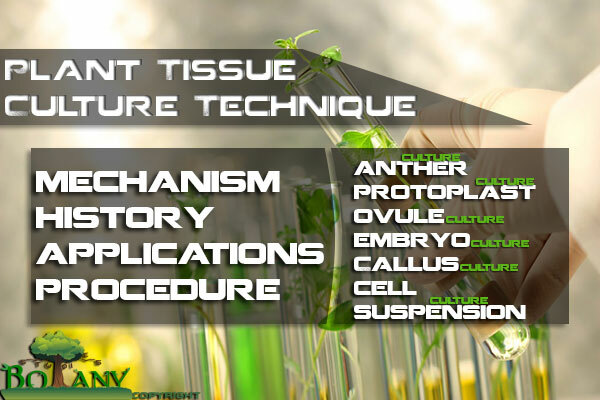 Plant tissue culture technique is divided into two many different types. It may be callus culture, cell suspension cultures, anther cultures, ovule culture, embryo culture, protoplast cultures or micropropagation. When an excised and isolated piece of tissue (ex-plant) is cultured on a nutrient medium, an unrecognized mass of cells appear. It is called callus. With age, such as callus may show meristemetic strands and individual or groups of trachieds and pigmented cells. This culture is transferred onto different media to regenerate plants. This technique is called callus culture. Regeneration of plants though callus culture provides genetic variability which is important for successful plant breeding. This variation induced in plants regenerated through tissue culture are called somaclonal variation. Many agriculturally useful variants have been obtained through somaclonal variation. Muir in 1953 started work on suspension culture. Morel and Wetmore 1951 and Ball in 1950 obtained cultured tissues of gymnosperms Sepia. The callus can be subdivided to increase the number of plants produced. 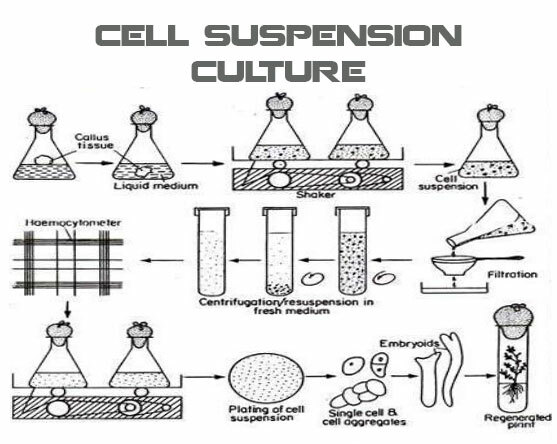 This is called cell-suspension culture. The pieces of callus are agitated in a liquid medium on a shaker. This culture is useful in inducing genetic variability in cells through physical and chemical mutagens. Guha and Maheshwari (1966, 1967) demonstrated potentiality of anthers in producing vast number of haploid embryos in culture (anther culture). Nitsch (1974, 1977) developed technique of isolated microspores of Tobacco and Datum. Anther culture is a means to produce plants with a gametic number of chromosomes by aseptic culture of anthers. It give rise to haploid plants. The haploid production has become an integral part of modern plant breeding. It quickens the breeding cycle by achieving homozygosity in one step through diplodization of the genetic chromosome number. The method is used in production of rice, wheat and tobacco varieties in China; and development of bread wheat variety in France. The ovule culture is an important tissue culture technique in modern plant breeding. It is advantageous: technology as it is easier to culture whole ovules than to isolate single globular embryos, especially in small-seeded species. This culture is particularly important in inter-specific and inter-generic crosses. Ovule culture allows direct hybridization of various species such as Glycine (bean), Gossypium (cotton), Nicotiana (tobacco), Brassica, etc. In embryo culture embryos are isolated from young seeds and placed on a solid medium containing nutrients and vitamins. The embryo are cultured at 25°C, first in dark until seedlings are about 2 cm long and root formation has started, than in the light until the seedlings can be planted in soil. Cocking (1960) pioneered protoplast technique. 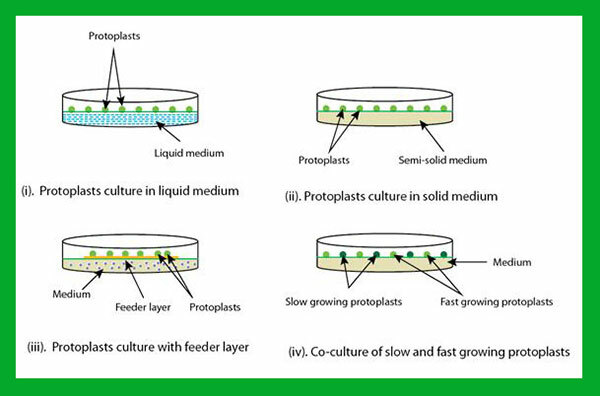 Takebe (1971) demonstrated plantlet formation from cultured protoplast. It is the most significant developments in the field of plant tissue culture has been isolation; culture and fusion of protoplast, i.e., all components of a plant cell excluding cell wall. The technique is especially important as it helps in studies of plant improvement, cell modifications; and somatic hybridization. Protoplast culture is used for induction of mutations and genetic variability and also for the production of somatic hybrids. Micropropagation may be defined as on vitro asexual propagation of crop plants. This technique is advantageous over the conventional practice of asexual propagation as only a small amount of plant is needed, species highly resistant to conventional bulk propagation can be propagated by this method, and it is non-season dependent. Micro-propagation is used for rapid multiplication of stocks, elimination of disease, germ plasm preservation, physiological studies and induction of mutation. This method makes it possible to study in detail the process of fertilization and embryogenesis in controlled conditions, to obtain viable seeds, to raise hybrids when normal hybridization fails, an to induce parthenogenesis and the development off haploid embryos and plants. In vitro self pollination of placentas with ovule has been performed successfully with about 35 species, usually those whose ovaries contained a large number of ovules. 1. By culturing different tissues on artificial media, knowledge about requirements of various chemical substances (minerals) necessary for the growth of those tissues is found. 2. Organogenesis has been studied by inducing formation of roots, shoot tips, etc. From callus on nutrient mediums. 3. Plant tissue culture technique has helped in studying various biochemical and physiological processes in pure cultures without complications of other factors. 4. Recessive traits can be studied in haploid plants raised by anther culture technique. Similarly, mutations induced in haploids can be easily detected. 5. Protoplast culture technique has been used to raise hybrids of normally incompatible plant species. 6. The effect of various hormone on differentiation and growth processes can be studied by using tissue culture technique. Hybrid vigor is important in crops improvement. Normally homozygous true-breeding cultivars are obtained by selfing for many generations which requires work for many generation. 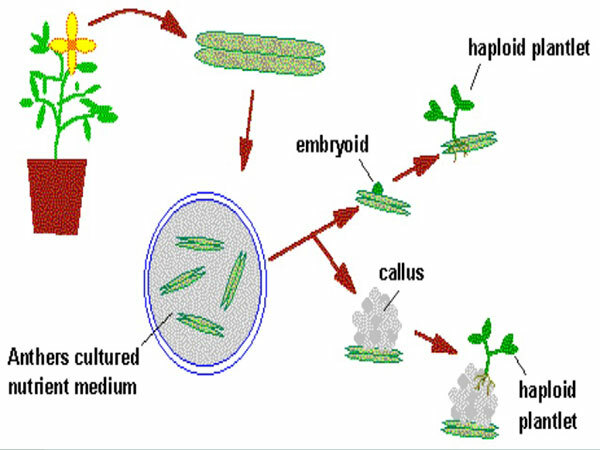 After culture technique has helped in raising haploid plants and then diplodization of these haploid plants by using colchicines result in production of homozygous diploids in limited period of time. Embryo culture technique can be used to break seed dormancy. This has enabled in shortening of long dormancy periods in certain horticulture plants, thus shortening the breeding time. Also seed viability can be tested by germination excised embryos. In plant breeding all desirable crosses are not successful mostly due to death of embryo at early stage or endosperm embryo incompatibility. In such cases, complete viable plants can be raised by embryo culture or protoplasts culture technique. It is quite difficult to maintain the crop varieties in pure form under natural field conditions. However, tissue culture technique has helped in maintaining genetically pure clone indefinitely. This help in averting loss of desirable characters. In certain fields, such as forestry a very large number of plants are required. Multiplication of plants by natural methods involves longer periods of time and large space. Tissue culture technique has helped in raising a large number of plants in very short time and small space that can be planted accordingly.